You said, “More shows with chickens!” and we heard you. Loosely inspired by the Odysseus myth, Year of the Rooster takes us unabashedly and unconventionally into the filthy world of cockfighting. Hapless fast-food pusher, Gil, delves deeper and deeper into the business of pitting animal against animal in this acid-tongued comedy. Without guidance, he may lose his grasp on all that’s dear to him, including his relationship with the very bird he’s trained to fight like a champion. 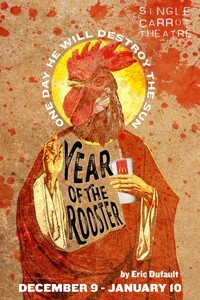 Year of the Rooster by Eric Dufault! EARLY ON IN THEIR CAREERS, playwrights Jen Silverman and Eric Dufault, two rising stars of theater, shared a small apartment in New York City. These writers explored their creativity while building a lasting friendship in tight quarters having a mutual admiration for each other’s work. Single Carrot Theatre’s 9th season, entitled No-Fear, New Work, features the work of both of these young and witty playwrights. Silverman’s Phoebe in Winter, a darkly hilarious exploration of familial bonds in a post-war universe, ran this fall with great reviews, and Dufault’s Year of the Rooster, a profound and gritty comedy about cockfighting and salvation, is currently running through January 10th at Single Carrot Theatre in Remington. It is interesting to see how their roommate experience informed their work, so we had them sit down with each other to delve a bit deeper into their relationship. Read excerpts from their interviews in What Weekly! Cocktails and team trivia at 7 p.m. in the Single Carrot Rehearsal Hall. The event will be followed by a performance of Year of the Rooster by Eric Dufault at 8 p.m.
A suburban-to-urban transplant, Amy Langrehr began raising chickens in her Hampden rowhome just four years ago. The food blogger will be introducing one of “the girls” to the audience following Year of the Rooster performance on Sunday, Jan. 3. Langrehr will speak about raising chickens in an urban environment, different breeds, licenses, the differences between chickens and roosters and things to consider when setting up a chicken coop. Join us on Thursday, Jan. 7 at 7 p.m. for drinks and conversation in the lobby followed by a performance of Year of the Rooster at 8 p.m.